I am due for a new pair of leo print flats, they are my favorites. That is a cute way to wear it! I didn’t think about wearing it with my thermal cardi. I agree, it is also in my SSR but it would look better with the leather jacket if it were an inch longer. I still have the medium, so I may try that and see if it fits better, but since I already wore the small, I can’t return it. I suppose I could try to sell it if I decide the medium is better. I love that it’s so big again this season. I just bought some leopard booties, and I’m sure they will be getting a ton of love. The other piece is my leopard coat that I got secondhand last year. I’ve already worn it once this season, because we had snow yesterday!! 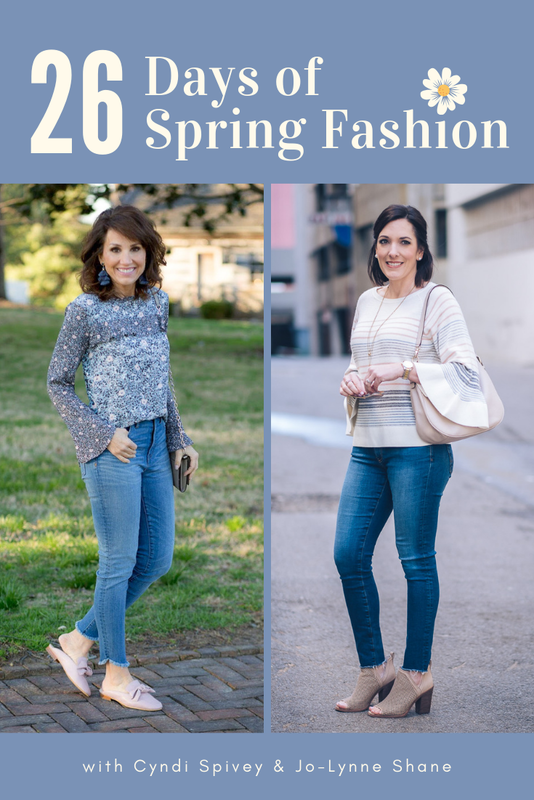 As I was reading this post I was thinking about how I have grown to only like leopard print in accessories and then I saw the leopard sweater and I think I just fell in love… it’s so fabulous! Ha, same! I wasn’t planning to add any leopard print clothing, but then I saw this. I like that the print is kind of subtle, not so literal. Happy Monday! Leopard and camo are two prints I really like. Since I have not found leopard shoes, of any style, to fit my specifications, I have decided to look for and order a leopard handbag. I hope you will let us know what, if anything, the MRI revealed about your problem foot. Early voting begins today, so that is the first thing we will be doing. Have a blessed day! Kate spade.com has a cute one on sale plus you get 30% off… if you like it. Hope you find one. Ginger, I have the Kate Spade leather bag! I love it! Good luck with your MRI results hope it’s good news. Our daughter is waiting to have one it’s a long wait here. Leopard print is my favorite!!!! Leopard is definitely one of the trends I can get behind these days. I can’t believe how much I’m seeing of it right now. I even saw it on Hunter boots! I’m picking up my second attempt at a leopard print cardigan today and would love to add a pair of slip ons if I can find the right pair, but I’m otherwise set in this department, lol. I’m so glad you included the pic with the vest. I’d totally forgotten about it and it was one of my all time favs from you! Question though…I know it’s been around awhile, but with it being all the rage right now, do you think with so much more exposure, people will just get over it and it completely fizzle out and actually become dated?? Does that even make sense?! Interesting thought… I honestly don’t know. Would there ever be a time to wear 2 leopard items, say — scarf and shoes; bracelet and belt; etc or is it just one and done. Hi Jo-Lynne! I can’t believe we both posted about Leopard Print today. That’s wild! (get it!) I absolutely love your leopard print sweater! That’s the one thing missing from my post. I got through writing it and then the very next morning I noticed my leopard print blouse in my closet. I had posted every other article of clothing imaginable…but no top! Ha! Anyhow, you look striking in that sweater! Meow! Am loving all the leopard!! That leopard scarf and gold cardigan is the first outfit I remember after finding your blog. I think I still have the gold sweater that I bought because I loved it so much. It’s a great look!! Time flies, for sure!! Me again,,, just on a side note, Do you wear compression stockings when you run? No. I used to when I was running longer distances and training for my half marathon. But not since. Good luck with your MRI! Hope everything goes well and you get answers. Make sure to get noise cancellation headphones/ ear plugs. Have fun at the game tonight. I am really into the leopard print this year. Today I am styling mules, earrings and a necklace. I hope it is not too much together! I also purchased some booties and a cami and a purse! Wow I just realized how much stuff that is! Have a great day! Hi Jolynne! LOVE this post. I recently found a leopard print vest and scarf from a thrift shop and am thrilled with them. The vest is from Coldwater Creek so it’s a nice one. Anyhoo this post gave me so much inspiration. I hope the results from your MRI are good. Thanks for all you share with us about your personal life and all the hard work you put into your blog. It’s very much appreciated! Animal print is my favorite print! I have the cami you have…love it. I actually wore it last week with a skirt. It was cute but didn’t quite feel like my style! I’m dying for some leopard and/or snake shoes, but I’m very picky about them. Do you find the pony hair wears off? Mine never last all that long (sadly). Hm, can’t say I’ve had that problem, and I have a few pairs of Sam Edelman hair calf shoes that I’ve had for years. Love all the looks. Thank you Jo-Lynne. Do you shop at the place advertised on your page? Which one? I can’t control all the ads on my page. I shop at the places listed on the sidebar under Where I Shop. You have an awesome collection of leopard accessories. I think you just need to add the Nickel & Suede earrings. 😉. I love them! Happy hump day! The #2 outfit with the mustard cardigan and leopard print scarf is one of my all time favorite outfits on you!